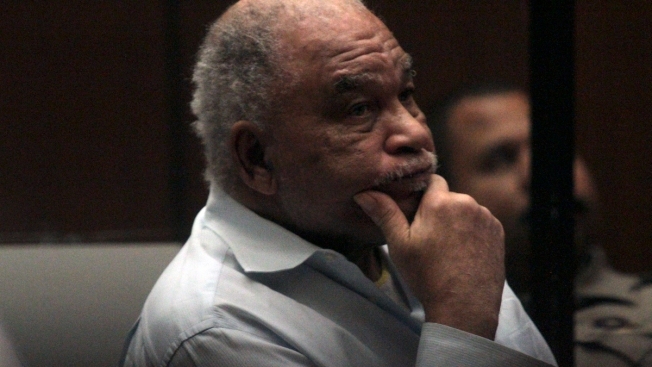 Samuel Little, who was indicted on charges that he murdered three women in Los Angeles in the 1980s, listens to opening statements as his trial begins on August 18, 2014. A 78-year-old inmate who says he killed roughly 90 people as he moved around the country for nearly four decades offered his confessions as a bargaining chip to be moved from a California prison, authorities say. The FBI said in a statement Tuesday that Samuel Little offered the deal in exchange for being moved from California State Prison in Los Angeles County, but it didn't say why he requested the transfer, where he asked to go or whether his offer was accepted. It did say that Little, in poor health and reliant on a wheelchair, will likely stay in jail until his death in Texas, where he was brought in September to face charges in the 1994 killing of a woman in Odessa. Little was convicted in 2014 of killing three women in separate attacks in Los Angeles County in the 1980s. A Texas Ranger, James Holland, traveled to California earlier this year to interview Little about the 1994 Odessa killing. That interview resulted in a series of confessions and near daily discussions "to create the most accurate accounting possible of Little's crimes," according to the FBI statement. Based on information Little has provided, authorities in several states have already confirmed his ties to 34 killings that happened between 1970 and 2005, not including the three he was convicted of in California. Investigators in Mississippi and South Carolina recently announced that they had closed cold cases based on Little's information. And police in Maryland and other states are looking into whether it can help them solve their own unsolved killings, including the 1973 strangulation in Omaha, Nebraska, of Agatha White Buffalo, whose body was found upside-down in a 55-gallon drum.